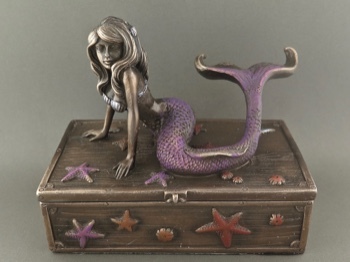 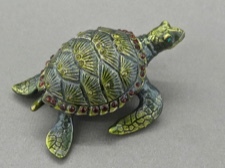 Shiver me timbers matey - there's a mermaid on my treasure chest r r......Gloriously graceful and sweetly detailed mermaid on starfish studded rectangle trinket box. 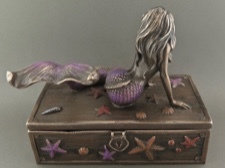 Box is cold cast bronze resin, which is bronze powder mixed with resin that gives a warm, durable bronze luster. 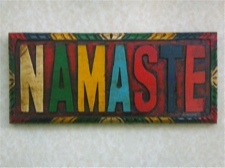 Colorful accents are handpainted. 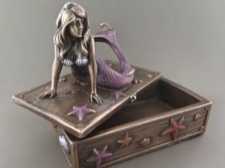 Treasure chest measures 5 x 2.75 inches, and with mermaid is 4 inches tall.